With customized solutions when it comes to credit rating. Rating Advisory helps you understand the rating agencies’ world. We support you throughout the entire rating process. Whether through shadow ratings, in-depth analyses or automated rating tools, we have the solutions to limit your risk as an investor. We review rating agencies’ compliance with policies and present detailed recommendations for action. We support capital markets participants in their relationships with credit rating agencies and assist them with optimizing their credit ratings. We further support institutional investors in understanding the variety of credit rating methodologies, which often result in different ratings. Also, we support national supervisory authorities, as well as credit rating agency regulators and funds to fulfill their assignment more effectively by examining proactively, whether credit rating agencies comply with the imposed set of analytical requirements. We support capital markets participants with tailor-made solutions for credit ratings. We service issuers, institutional investors, financial regulatory authorities and funds; each with specific product solutions. Rating Advisory differentiates itself from other firms in the industry by its unconditional independence. Unlike large banks who sometimes advise their clients on rating-related items, Rating Advisory does not offer direct financing nor connects clients with potential investors, which is the reason our audience regards the company as truthfully independent. Please find below a selection of our products. We would be glad to tailor each product according to your needs. Rating Advisory helps you understand the rating agencies’ world. We support you throughout the entire rating process. Whether it is your first time or you are a returning customer at the rating agencies, we outline the different approaches of rating agencies for you and support you in evaluating the one that is just right for you. Do you already have a rating? We examine if the rating is fair. Based on international experience we are able to compare your rating factor assessments with those of the peer group. Should we figure out that there is still headroom for a higher rating, we’d be glad to advise you on further steps. Upon request, we also handle the communication with the rating agencies, in order for you to receive the desired credit rating. Do you think the degree of creditworthiness is underappreciated by the rating agency? Rating Advisory helps you to enforce your interests. We outline the far-reaching possibilities for you, starting with a simple reclamation at the rating agency, through to official complaints at ESMA (European Securities and Markets Authority), up to legal actions against an agency. Structure and application of criteria vary among the different rating agencies. Rating Advisory helps you keep track of it. We outline the different rating factors and explain how they are interrelated. Furthermore, upon request, we explain differences and, where applicable, similarities between international rating agencies by using the example of a business case. We compile likely consequences of current events on the rating for you, as well as how your rating interacts with other entities’ ratings, such as banks, regional governments, and sovereigns. Rating Advisory prepares shadow-ratings on desired banks or regional governments. Consequently, you receive an excellent indication of the creditworthiness under the preferred rating agency’s methodology. In order to meet your expectations in the long-term, we advise you further on choosing from the variety of rating agencies and the respective application of criteria. 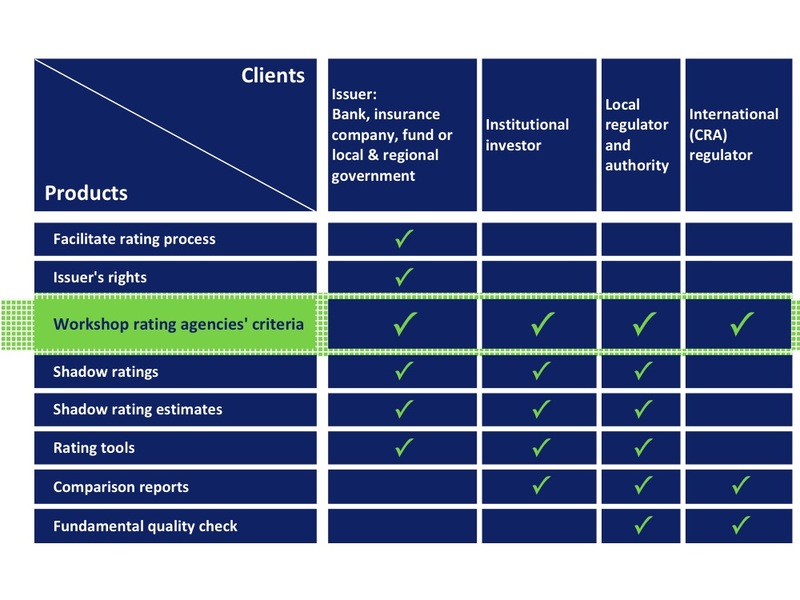 Rating Advisory prepares shadow-rating-estimates on desired banks or regional governments too. The result here is usually a range of three rating notches. They are quicker to produce and therefore rather inexpensive for you to purchase. Also here, in order to meet your expectations in the long-term, we advise you further on choosing from the variety of rating agencies and the respective application of criteria. Rating Advisory is involved in developing rating tools from scratch, as well as revising them according to up-to-date methodologies. IT-based tools for assessing creditworthiness happen to be outdated very often and their fundamental assumptions are not maintained on a regular basis. This leads inevitably to incorrect results and misleading expectations. Correspondingly fundamental scoring structures, meaning the rating factor’s logic, need to be updated regularly in order to reflect state of the art information. Rating Advisory examines which rating tool and scoring structure makes the most sense for your purposes and supports you to either develop a new rating tool or adopt the current one. Overall this leads you to keep track of probability of default rates and helps you conceive an informed opinion about your clients’ creditworthiness. Rating Advisory authors reports focusing on entities’ relative strength and weaknesses, compared to their respective peer groups. For this purpose, we include rated, as well as non-rated entities and of course take the same international criteria and standards as a basis. Credit rating agency (CRA) regulators, i.e. international regulators, towards which significant rating agencies have an obligation, fulfill a very important but also very complex task. It includes procuring that rating agencies adhere to specialized standards and international guidelines. Rating Advisory supports national authorities as well as international regulators to review the guidelines/policies and presents detailed reports about the findings. Ron Slomovits has established Rating Advisory after twelve years of professional experience in the financial and consulting industry. He supports capital markets participants on credit rating related matters, specializing in banks, insurance companies, regional government and funds. The company offers a broad variety of products, that all have one thing in common: to deepen market participants’ knowledge in credit ratings, which finally puts them in the driver’s seat when it comes down to assessing the creditworthiness of international entities. The basis for that knowledge, Mr. Slomovits gained at the international rating agency Standard & Poor’s, at the department of Sovereigns/International Public Finance. He covered ratings on states and municipalities as well as government-related entities in Austria and Germany and worked closely with the Financial Institutions team on bank ratings. In this role, he led annual personal meetings with high-placed government officials in order to analyze creditworthiness of states and municipalities. Mr. Slomovits was also engaged in various sovereign and bank ratings in order to assess and quantify the interrelationship between the entities. Prior to joining Standard and Poor’s Mr. Slomovits worked as a credit analyst with an Austrian bank, where he gained many years of professional experience in the field of European banking analysis / stress testing and prepared investment decisions by analyzing the financial robustness of 57 worldwide major banks. Mr. Slomovits holds a master’s degree from Vienna University of Economics and Business. Your concern is our concern!